It used to be something major and unique for someone to always be busy, occupied or on the move. But, guess what? Just about everyone falls into the category of busy nowadays. We all have somewhere to be, something to do and someone to meet up with. Our packed (and sometimes overpacked) calendars consume our lives and sometimes pull us away from even the most essential and critical part of our commitments and responsibilities.These consistent distractions cause us to be in a constant state of busy and to miss out on the simple human interactions that are unique and provide opportunities to connect, share and grow. It’s OK to speak when you enter the elevator. You just might be the person to break the awkward silence or even create an unsuspecting relationship from a simple hello. Holding the door open for the next person will not kill you. That 4-5 extra seconds will not derail your entire day. Isn’t it interesting (or annoying) when people approach your desk or call your business (or personal) line and just start immediately ranting about something that they need? 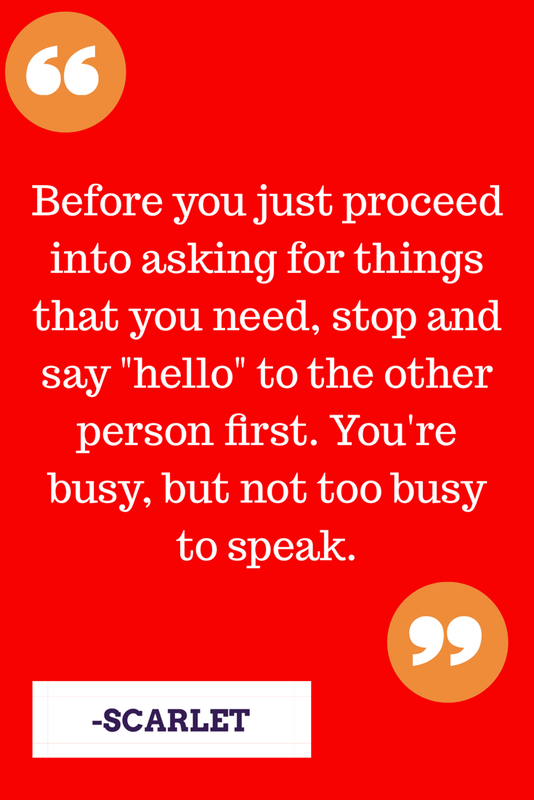 Before you just proceed into asking for things that you need, stop and say “hello” to the other person first. You’re busy, but not too busy to speak, first. Scarlet Says…Make no mistake. 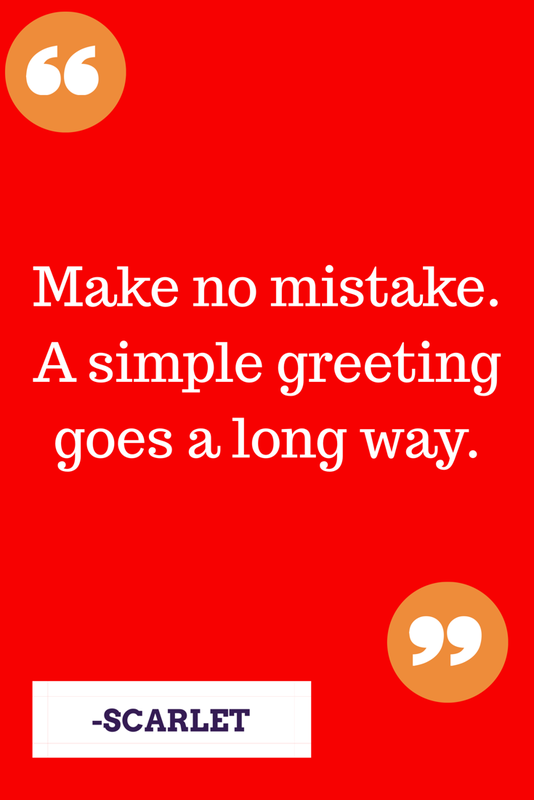 A simple greeting goes a long way. Before you just proceed into asking for things that you need, stop and properly greet people and take advantage of opportunities to connect and grow your relationships. Are you looking for ways to continue to grow your relationships with friends, families and co-workers? Download this free Relationship Formula guide from our Founder, Jacqueline M. Baker. Next Next post: You Don’t Need Permission To Lead!